This recipe is adapted from Food & Wine. I made this non-alcoholic but I people also added it to their Champagne and it was quite good that way also! Place fresh cranberries in a bundt pan and cover them with hot water. Immediately place in freezer and freeze for at least 2 hours, or until frozen. Note: the hot water will freeze clear. Pour cranberry juice into a large punch bowl and stir in sugar. Mix until sugar is completely dissolved. Pour sparkling wine and sweet wine into cranberry mixture and give a gentle stir. Retrieve cranberry bundt from freezer and run hot water over the bottom, releasing ice from pan. 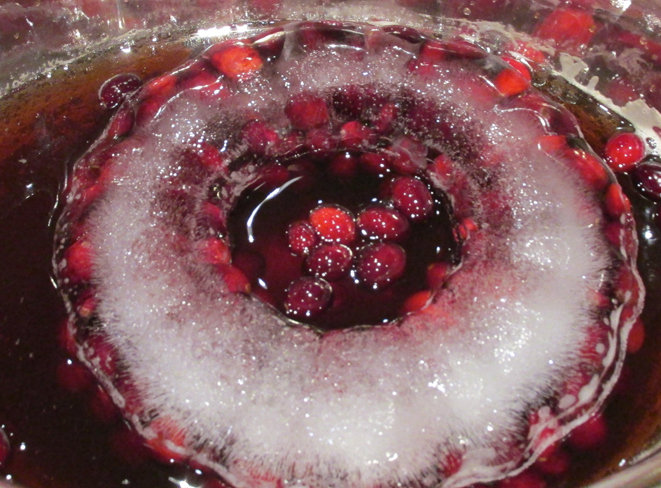 Place cranberry ice ring in bowl to chill and decorate punch. Ladle punch into glasses and garnish with skewered cranberries. I am confused. Directions unclear to me— if using cranberry juice and white grape juice do I use sugar.—-28 oz. of cranberry but how many oz. of wine or champagne? If using alcohol then what juices? Directions to unmold bundt ring.